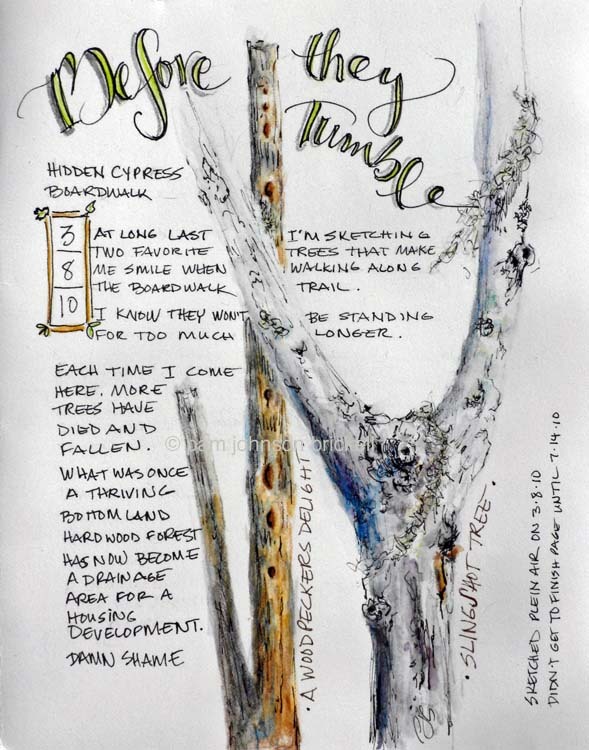 Back in March I finally had the opportunity to sketch 2 trees (very dead) that I enjoy keeping track of. This spring, every time we walked this trail, more and more trees had rotted and fallen due to unnatural standing water. Poor judgement or lack of care in this housing development turned a Bottom Land Hardwood Forest into a cattail swamp. I favored the tree formed like a huge sling shot and was always amazed at the dead stump with huge woodpecker holes. Pileated by the looks. The last time I walked the trail in early June, both had tumbled. I was just able to finish the type on the page this week. A tad behind in journal keeping! Isn't it sad when they just die PJ? But then they serve so many other purposes afterwards - food for the ants, back to earth, enriching the soil... glad you captured this before they are all gone. Just love this page, beautiful! Thank you, Elizabeth! I am so happy I was able to capture them. I would have been so disappointed had they tumbled be for I drew them. Thanks, Maree! The southern bugs & critters will love the addition. Plus, if the water stays low enough, the fallen trees and rotted cattails will build up enough soil that perhaps red maples and willows will begin to grow. Lovely commemoration of the trees. I wish I'd sketched the sycamores the road crews cut down this summer :( You may not be saving them from dying, but you're capturing them and their elusive beauty on paper forever :) Sounds like you're having a good summer! Hi Rhonda, thanks for stopping in. Yes, if I draw a tree it feels like it lives forever :) We are enjoying a short break from the southern heat. I hear our area has a heat index of 102 today. Now that's toasty!